“Across the Valley” is off to Winton, having been selected for The John Villiers Waltzing Matilda Outback Art Show 2013. The John Villiers Waltzing Matilda Outback Art Show is run annually always with a theme, 2013 being ‘Outback Legends, Outback Landscapes’. This exhibition opens on 17th May. Themes can sometimes be tricky, as I tend not to paint to these, usually working from sketches I have done previously. However this painting “Across the Valley” an oil of Hughenden area, done from sketches while doing koala research in the district was, I thought, suitable for this exhibition. I guess the judges thought so too! “Western Ranges” a watercolour/acrylic will be hanging here in the Rockhampton Art Gallery, having been selected for the Bayton Award 2013. The Bayton Award for Central Queensland artists is a biennial, non-acquisitive prize celebrating the diversity and excitement of visual arts in Central Queensland. Bishop Bayton resided in Rockhampton and served as the Dean of the Anglican Church for many years. During those years he was very involved in the promotion of the arts in Rockhampton.The award is restricted to artists in Central Queensland. 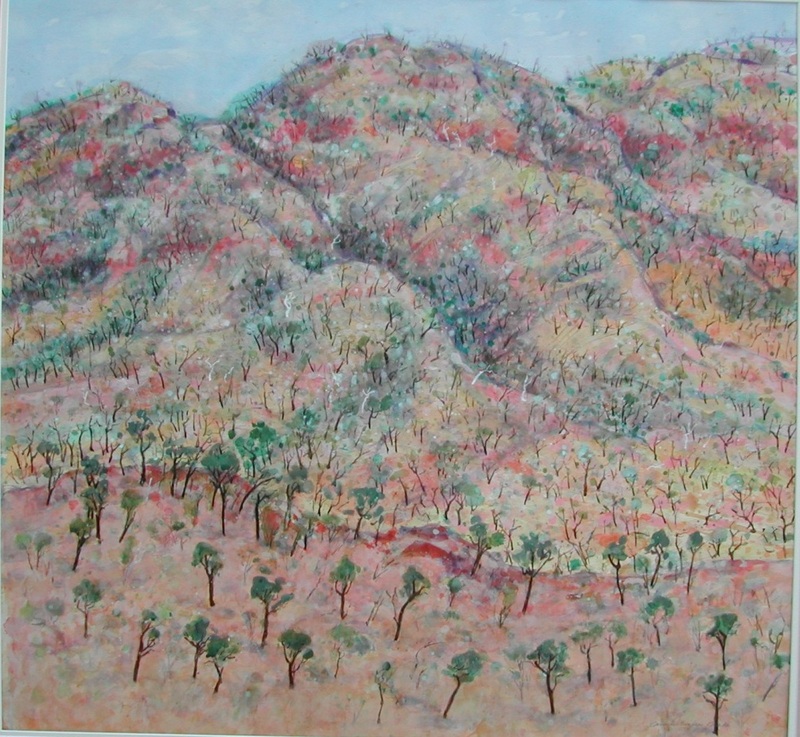 “Western Ranges” is painting also from sketches done while travelling on the Midlander to Barcaldine where the train slowly winds in and around the Drummond Range.